Wall Street's biggest Tesla bear, Vertical Research's Gordon Johnson, reiterated his "sell" rating and lowered his price target to $54 — 80% below shares were trading Friday. He says Tesla is "running out of people who want to buy its cars." Johnson is also worried about heavy competition coming from the likes of Jaguar, Porsche, and Mercedes. 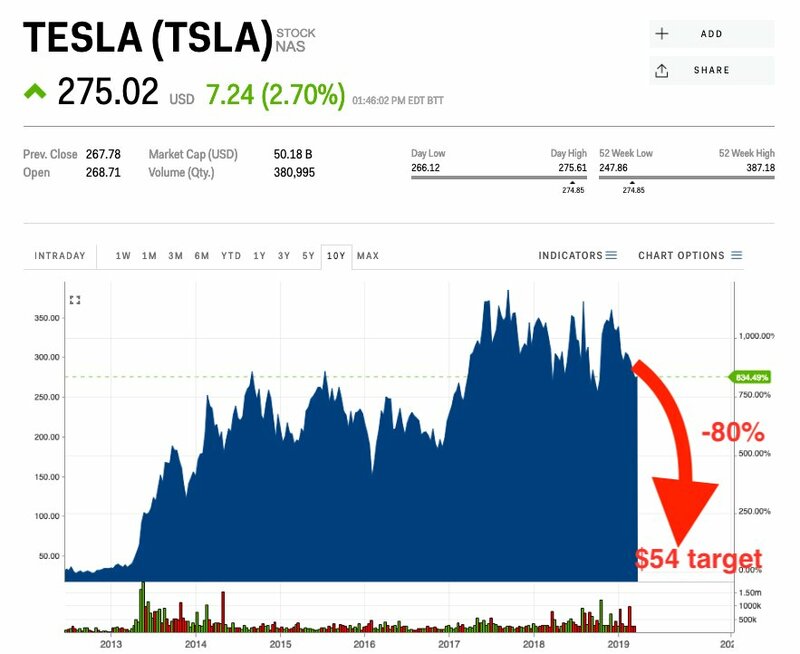 Tesla is set to plunge 80% to $54 a share, a level last seen in May 2013, according to the biggest Tesla bear on Wall Street. "Tesla is running out of people who want to buy its cars," the Vertical Research analyst Gordon Johnson said. He cited the electric-car maker's weak first-quarter delivery, which showed deliveries were down more than 30% quarter-over-quarter, as being particularly ominous given the exhaustion of European demand, the opening of China to the Model 3, and the recent price cuts in the US. In light of this, Johnson strongly doubts Tesla will be able to meet its 2019 delivery guidance of 370,000 to 400,000 vehicles, which it reiterated alongside its first-quarter announcement. Deliveries would have to pick up 57% from the first quarter to meet the low-end of the guidance and almost 80% to reach the high-end.